Oktoberfest Munich is the biggest folk festival in the world. For many people abroad the Oktoberfest in Germany defines German culture. Is this really true? Actually, the Oktoberfest reflects the culture of Bavaria, not the entire country Germany. Other German states have their unique folk festivals as well (Cannstatter Wasen in Stuttgart, Freimarkt in Bremen & the Rheinkirmes in Düsseldorf for example). These fairs attract also millions of visitors each year. However, none of these folk festivals is so well-known internationally and draw so many visitors from all around the world to Germany. Statistics say that roughly 70% vistors to the Oktoberfest Munich come from Bavaria, 15 % from the rest of Germany and 15% from European countries, the US, Australia and Canada. The locals call the festival the "Wiesn". Why? I am going to tell you about the origins of the Oktobefest in the history section. 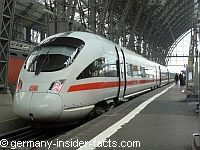 Although the Oktoberfest in Munich has a reputation of being a huge beer drinking gathering, there are attractions and events for the entire family. You just need to know when and where to go on the festival grounds. That's where my friend Marion's Oktoberfest Guide comes in handy! 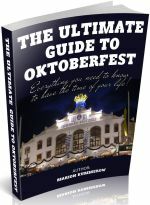 As a Munich local she knows everything about the Oktoberfest and can give you invaluable tips. The guide is available as Kindle ebook and paperback from Amazon, so you can download it within minutes or take the paperback version with your on your visit. The first Oktoberfest in Munich took place on 12th Oktober 1812 to celebrate the marriage of Crown Prince Ludwig (who became King Ludwig I later) and Princess Therese of Saxony-Hildburghausen. Munich's citizens were invited to join the festivity which was held on a field on the city's outskirts. In honour of the new-wed princess it was named Theresienwiese (Theresia's meadow). The festivities ended with a horse race, and it was decided to repeat the race in the following year. An agricultural show, beers stalls, merry-go-rounds and other amusements were added to the festival over the years. The horse race is no longer held, but the Oktoberfest is still celebrated on the Theresienwiese in Munich. So welcome to the Wiesn as the locals say. Okay, here are some statistics and facts, about visitor numbers, size of the Wiesn'n and the current beer price. You might ask why is the Oktoberfest held in September, despite its name? Well, this is because of the weather. September is usually a bit warmer. The festival closes on the first Sunday in October. When the first or second October is on a weekend, the fair lasts until the 3rd because this is our national holiday. Visitors - The Oktoberfest has attracted between 5 and 7 million visitors each year during the last decade. Size - The festival grounds on Theresienwiese covers 31 hectare, that's 310,000 square metres. Beer - Oktoberfest beer is a lager or Märzenbier brewed by Munich breweries for the festival. With an alcohol level of 6 -7 % it is slightly stronger than normal German beer. The price of a Maß beer is a subject for heated discussions as it usually goes up every year. The price for a Maß varies from tent to tent and costs between € 10.10 and € 10.40 in 2015. 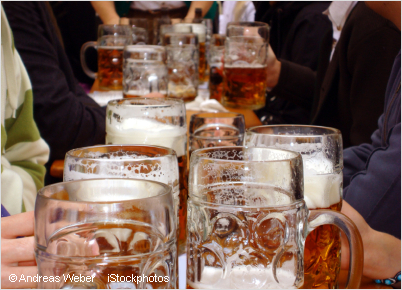 The average beer consume during the Oktoberfest is about 60,000 hectolitre. Maß - Beer is served in the Maß, a huge mug that contains 1 litre. At the Oktoberfest the Maß is always made of glass, so you can see that your Maß is full. Be aware that the beer mugs belong to the breweries, taking them as a souvenir can bring you in deep trouble. Of course, there are beer mugs you can purchase as a souvenir. Attractions include traditional and modern fun rides, for example a ferris wheel, toboggan and the Olympia looping. Entry to the Oktoberfest grounds (Wiesn) is free, you don't even need to pay to go into the tents. Oktoberfest music includes traditional Bavarian wind music (Blasmusik), German hits and occasionally international pop songs. The most famous songs are "In München steht ein Hofbräuhaus", "Ich bin der Anton aus Tirol", "Marmor, Stein und Eisen bricht" and "Viva Colonia2. 2018 Dates - Oktoberfest in Munich opens on Saturday 22nd September, the last day of the fair is Sunday 7th October 2018. Hours - Tents are open from 10am to 11:30pm on weekdays and from 9am to 11:30pm on weekends, while the last beer is served at 10:30pm. Grand opening - The festival begins with the procession of landlords, breweries and showmen to the Theresienwiese at 11am on Saturday. 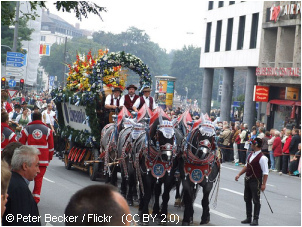 The parade is accompanied by brass bands and lead by the Münchner Kindl and the Lord Mayor of Munich. Once the mayor has tapped the first barrel of beer in the Schottenhamel tent and shouts out O'zapft is, the festival is opened. The honour of the first beer belongs to Bavaria's minister president. Although the fair opens at 9am on the that day, don't expect to get a beer before the official tapping. The traditional Costume and Riflemen's Parade on Sunday 23st September at 10:00am. Oktoberfest & kids - The festival is a fun fair for the entire family, and children just love all the exciting fun rides and things to see at the Wiesn. Tuesdays are family days at the Oktoberfest. All rides & performances are discounted from 12 noon to 6 pm. Children under the age of six are not allowed in beer tents past 8pm. The crowded tent wouldn't be much fun for children anyway. Kids up to the age of 16 can only go with their parents and are not allowed to drink beer, or any other alcohol. Church Service - On Thursday 27st September, 10am, the traditional Oktoberfest mass is held for all showmen and visitors. Sunday 30th September - brass band concert of all Wiesn bands at the Bavaria monument at 11am. 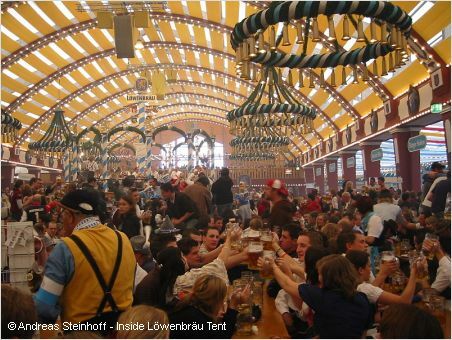 The Oktoberfest tents are not really tents but often huge halls made from steel and wood. They are erected only for the Octoberfest, and then removed from the Wiesn until the next year. There are 14 large tents with seats for up to 10,000 people, inside and outside. Then there are about 18 smaller tents with seats for a few hundred guests. In summary, there are seats for more than 100,000 visitors at the Oktoberfest in Germany. Hofbräu-Festzelt - This is the Oktoberfest home of the famous Hofbräuhaus, that's why this tent is a favourite of international tourists and celebrities. It is by far the largest tent with over 6000 seats inside, 3000 outside, and as a novelity, 1000 standing tables. The atmosphere here can get a bit wild at times. 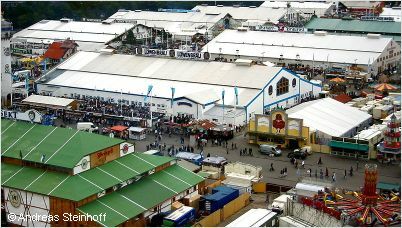 Schottenhamel - Another large tent and the oldest on the Oktoberfest. The official opening ceremony takes place at the Schottenhamel tent. It is also the traditional tent of Munich's student corporations. Löwenbräu-Festzelt - You can't miss this large tent! The 37m tower in front of the tent sticks out. Occasionally, you'll hear the lion roar "Löwenbräu". Hippodrom - 3,300 seats inside & 1000 outside in the beergarden. This is the most colourful tent, the first you will notice when you arrive at the Wiesn. In its beginnings (1902) the Hippodrom was a show and snacks tent with a race course inside. Update 2014 The bright red Hippodrom tent will be replaced by the Marstall tent. Ochsenbraterei - The attraction in this tent is the rotisserie to grill the oxen. Not the place for vegetarians I would say. Fischer-Vroni - The specialty of this smaller tent is the Steckerlfisch, a fish that is grilled on a stick right in the tent. On the second Monday of the Wiesn the lesbian & gay community celebrates Octoberfest in this tent. Augustiner-Festhalle - It is said that Augustinerbräu is the best Oktoberfest beer which is of course served in the tent with this name. This is a family-friendly tent and a favourite of the locals. Seat reservations in the tents can be made with the individual tent landlords for at least 10 people (that is 1 table). There is no reservation fee, but you have to purchase a food/beer voucher for two beer and 1/2 chicken, that will cost around € 30 to € 40 per person. Each tent has to provide non-reserved tables, but these fill up quickly, on weekends probably from noon. People who got a free table usually don't leave it anymore, so you need to go early to grab one. It is easier to catch a table during the week, but most tables will be reserved in the evenings and on weekends. Please note that beer will be only served to you when you've got a seat. Be careful when you see food vouchers including seat reservation offers on the internet. They are certainly totally overpriced. If you don't get a reservation with one of the tent landlords anymore, you can try a tour operator, or maybe you are lucky at your Munich hotel, as hotels often buy some tickets for their guests. One or two people usually don't have much problems to find a seat in the tents, but for larger groups this can be a challenge. 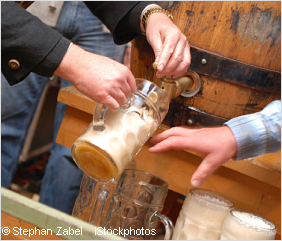 If you don't live in or around Munich, it is a good idea to plan your Oktoberfest in advance.